Tonight's goal: sew the shoulder seams and pick up stitches for the collar. I'm hoping to have the rest sewn up in time to wear it this weekend! I had way too much fun knitting this little sweater and even more fun photographing it. This little darling of a sweater is for the daughter of some friends of ours who is due to make her grand appearance sometime in April. I was thrilled to hear that they were expecting a girl, because much as I love knitting for all babies, girls are just so much more fun. 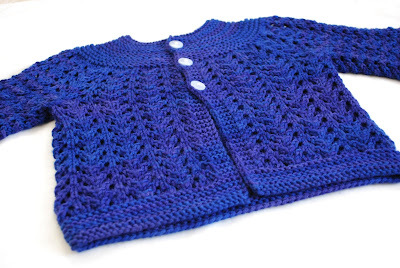 It'd been a while since the last February Baby Sweater, so I didn't have to think much about what pattern to knit. The buttons, though they're hard to see in these shots, were pulled from my craft store grab bag. They're translucent with just the slightest hint of purple, and I think they're a good match. 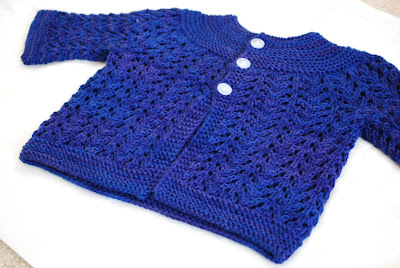 Having knit the baby-sized version of this sweater once and the adult-sized version once, too, the knitting was all smooth sailing. 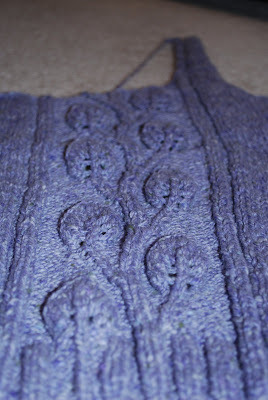 I slipped the first stitch of every row for a neat edge and gave it a nice blocking when it was done. Now I just have to wait for the baby to be born so I can present it to her parents! This post has been a long time coming, but I finally got The Mister, his sweater, and some sunlight together at the same time. If there's one positive thing I can say about this sweater, it's that it was a very interesting and fast knit. 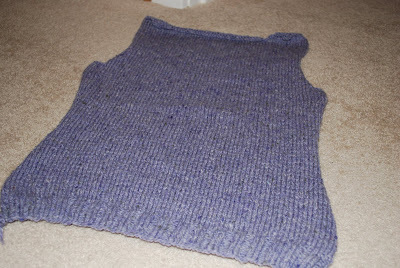 The sweater is knit from the top down, starting with the saddle shoulder. 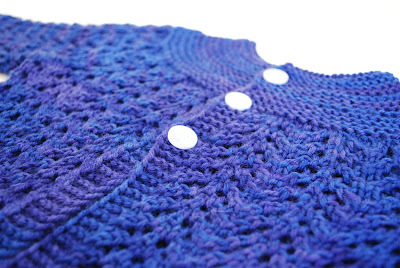 Stitches are then picked up along the back, with some short rows thrown in for upper-back shaping, and along the front, and then the front and back are joined under the arms and knit down for the rest of the body. The sleeves are worked with short rows to shape the sleeve caps and then worked down to the cuff. Finally, stitches are picked up around the neckline for a garter stitch collar. The large gauge combined with the seamless construction makes for a very quick knit, even for a man sweater. 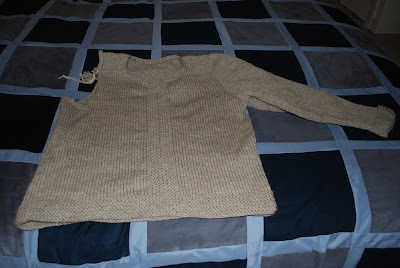 Unfortunately, the resulting garment -- perhaps especially knit in this color -- somewhat resembles a potato sack. Some aggressive blocking helped to smooth things out, but as you can see from the photo below, the upper arms are especially roomy. If I were better with the math and logic required to adapt sleeve shaping, I would have made them more narrow. In spite of this extra and somewhat unflattering ease, The Mister assures me that this is a very warm, comfy sweater. I don't think he'll be wearing it outside the house anytime soon, or at all, but it makes for a good lounging sweater for around the house. 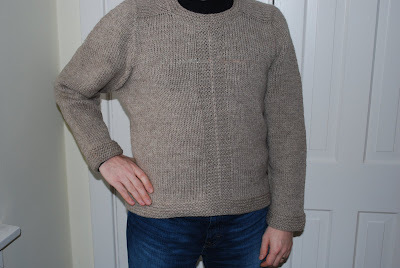 Another plus for this sweater is that it was very economical, which is something that's especially appreciated for a project that was less than a success. I used two full skeins of the Eco Wool along with only about 25 yards of a third skein for the collar -- which is probably about the same yardage I used on my swatch. So that means I got an entire man's sweater for about $30, not to mention many hours of knitting enjoyment. I just love how the leaves pop off the front, even though completing the last leaf at the top made me have to wing the decreases at the neckline. The sleeves are in the works, being knit at the same time, and I'm hoping to finish them up within a week so I can get to sewing this baby together. As to the toys, well, that's a story. You see, I placed the order for them at the Woolery some time ago, and it shipped quickly, arrived at its destination last weekend, and only got into my hands last night. Why, you ask? Well, even though I put in the correct address when I placed the order, my address was correct in the shipping confirmation e-mail, and (as I discovered upon opening the box) it was correct on the invoice, the box got sent to our old house. So, last night before Hurricane Knitting, I stopped by the old place to retrieve my package from the front stoop. Fortunately the contents were still dry, though the box had been dampened a bit from yesterday's rain. Now, here are my new toys! First, a new niddy noddy, an improvement upon the old one in so many ways. 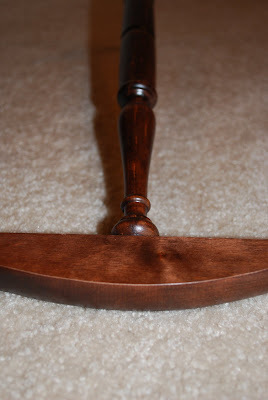 This is a walnut Kromski model that is a full two yards around. 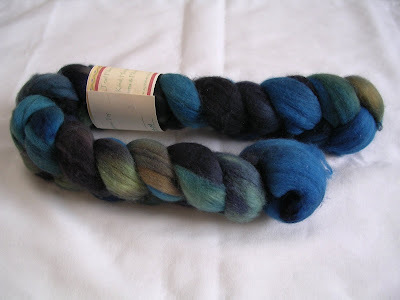 (A niddy noddy, for those of you unfamiliar with the tool, is used to skein handspun off a bobbin.) This will make it much easier to calculate my yardage, as my old niddy noddy was only 60" around and required a number of calculations to determine how much yarn I had. Now I'll just have to count my loops and multiply by two. I realize that this particular model matches Jen's wheel better than mine, but it's a better quality than mine and the two ends actually stay put. My other new toy is what's called a spinnner's control card. 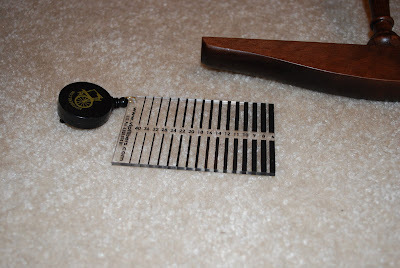 This is used to help you spin a particular thickness to achieve a desired weight of yarn. 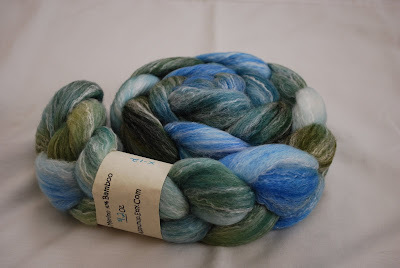 I'm hoping this will help me to spin a more consistent yarn as well. 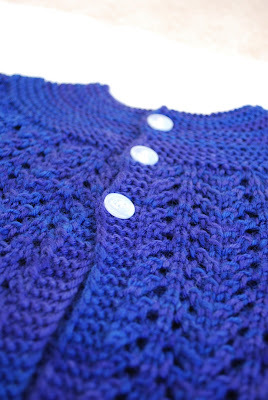 Still to be blogged: a finished project that inadvertently matched me last night at knitting! 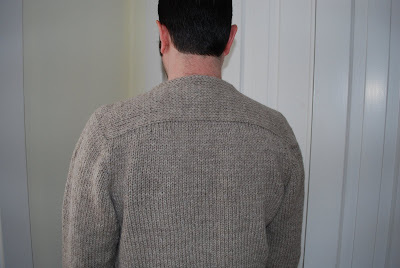 I was intending to have a post ready for tonight on The Mister's Big Thaw Pullover, but, alas, the weather did not cooperate long enough to do a proper photo shoot over the weekend, so it will have to wait. Suffice it to say that, as predicted, it's not the most flattering sweater in the world, but a good blocking did help and The Mister assures me that it's quite warm and comfortable. All the same, don't expect to see him wearing it around town; it's a strictly lounge-around-the-house type of garment. Can I distract you from the lack of sweater photos with some pretty fiber shots? I managed to grab my camera during the short period of time when we had sun on Saturday, just before I left to run several errands (but before The Mister was out of bed). 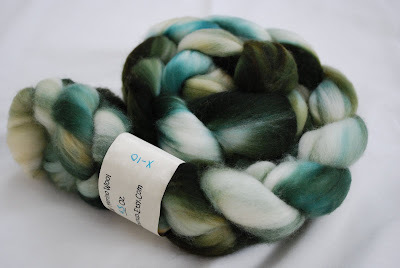 I snagged these two braids of top about a week and a half ago in an All Spun Up update; I'd been very good at resisting Kristin's fiber for a while, but I knew I had to snag these before someone else did. This one is a merino/bamboo, a blend that I really loved spinning up once before and that is destined to become some shiny laceweight. 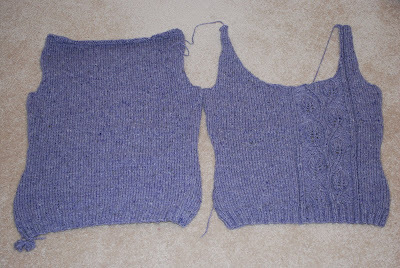 I should have some knitting to show you in the coming days -- progress on my Climbing Vines Pullover and a baby sweater. Stay tuned! The pride I feel from my most recent finished object is something akin to what I imagine a baker might feel upon finishing a fancy wedding cake made from scratch. I am not normally of a fan of toe up socks. I can never seem to get them to fit quite as well as those knit from the cuff down, not to mention the issues with a too-tight bind off. 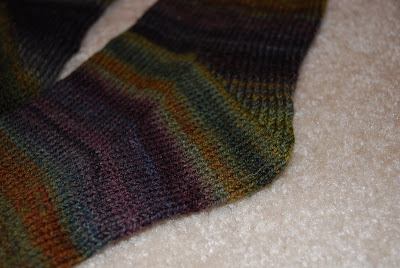 But because my yardage with this yarn was limited and I wanted to maximize my use of it, toe up was the way to go. 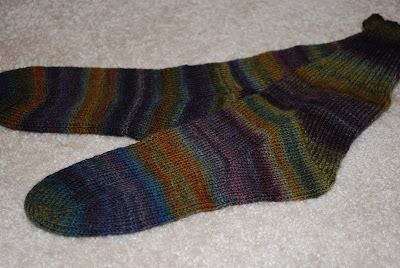 Inspired by Dave's socks, also knit with ASU handspun, I decided to try out this new heel. It is fabulous! 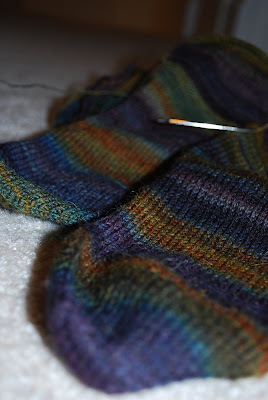 It starts with gusset increases, and then the heel is completed with what amounts to a really big heel turn that has the appearance of a short-row heel when worn. Working the last couple of decreases while knitting in the round again helps to eliminate any holes. 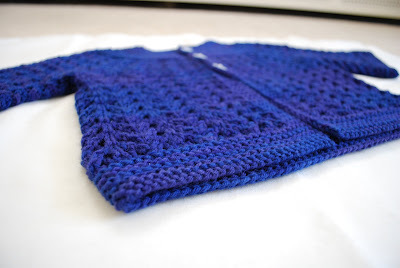 I solved the tightness at the top with Elizabeth Zimmermann's ingenious sewn bind off. I probably did it a little looser than necessary (so the top is a little ruffle-y when not worn), but it makes for quite a comfortable cuff. Amazingly, even with my big feet and a generous leg, I still have some yarn left, maybe enough for a pair of baby socks. And now I have some really cozy socks to wear to keep my feet warm as the temperatures are due to drop again (I guess yesterday's high 60s were only a tease). I had hoped to have modeled Big Thaw pictures for you this evening, but unfortunately The Mister came down with a nasty bout of stomach flu and has been in bed for the past two days, so his photo shoot will have to wait until he's back on his feet. 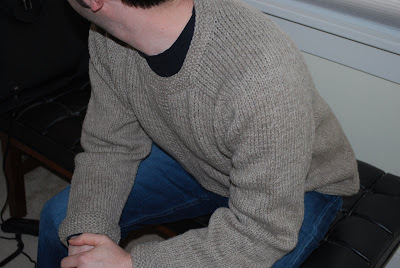 I do have some sweater I can show you, in this case the completed back to my Climbing Vines Pullover. I'm really loving this lavender Kathmandu Aran Tweed that Amy helped me to pick out at Bloomin Yarns. Tonight I start the front, which is by far the most interesting piece. 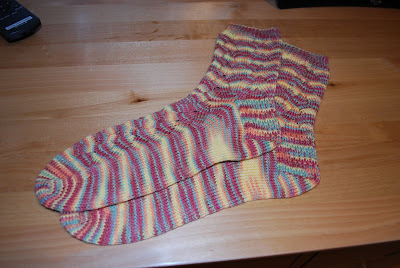 I'm knitting these toe up to maximize my yarn use, and I'll have some things to say about these when they're done. I just hope that the weather gets a little colder when they're done so I can wear them at least once before the end of winter! 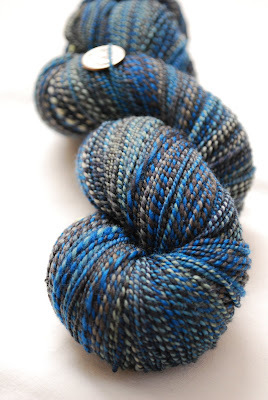 It's Sunday (somehow the rest of the week since my last post got away from me), so that means some pretty shots of handspun are in order. The latest yarn started life as this fiber, four ounces of superwash merino from Spirit Trail Fiberworks, purchased from the Loopy Ewe. 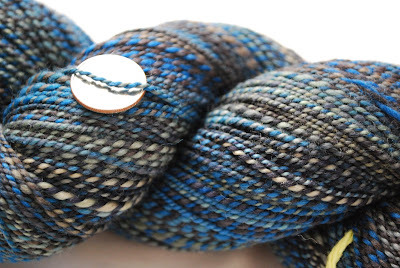 The colorway is Cape Cod -- a very appropriate name, in my opinon. I turned it into approximately 325 yards of two-ply, approximately sport weight, I'd say. The yardage is a little less than I was hoping for, but the appearance of the yarn is exactly what I wanted: great blending of colors and a nice tight twist. I think this will make some really squishy socks, don't you? The Mister's sweater is done and is getting a good blocking tonight. Modeled shots to come! So, I'm back. The Mister and I were away for the weekend in Deep Creek, Md., so he could do a little skiing. I do not ski (I've tried, and it doesn't agree with me), so I was happy to curl up with my knitting and watch some TV. 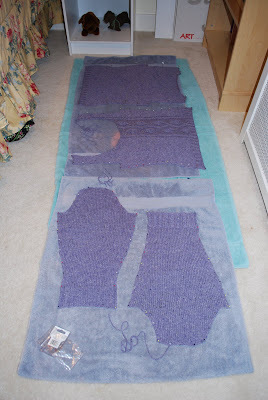 I managed to get the entire sleeve of his Big Thaw Pullover done before we left to come home. Unfortunately, it looks like this sweater is going the way of the Cambridge Jacket in its sleeve size. I'm beginning to think that men's patterns are written assuming a much more muscular build than my husband has. Perhaps those roomy arms are meant to be filled by large biceps? The Mister said he didn't mind the roomy arms so long as both arms are equally roomy, and I think it will work out okay as this sweater has a sweatshirt-y feel to it, but I think I'll stick with Elizabeth Zimmermann sweaters from now on. We were home in plenty of time to watch the Super Bowl; thankfully we stayed home, so I didn't have to scramble to get things together for a party. Needless to say, we were quite thrilled with the result of the game, though I could have done without the anxiety at the end of the fourth quarter. I did finish the second of my game-day dishcloths (knit entirely during the playoff games and the Super Bowl) just before the end of the game, and I'm thankful that I wasn't working on a fitted garment, because I'm pretty sure my gauge was affected by all the excitement. I took a vacation day from work yesterday, in part because I knew I'd be up late Sunday night but also because I needed a day to get some things done that I normally do on the weekends. Fortuitously, having the day off also allowed me to run over to Natural Stitches when it opened and sign up for Franklin's lace class. I know that I am already fairly experienced lace knitter, but I've never taken a real knitting class, so I thought it would be fun. It's also right before my birthday, so I'm considering it my birthday gift to myself. Plus, it's Franklin! These, along with a fair amount of leftover yarn, will be delivered to Renata, weather permitting, at tomorrow night's meeting of the Hurricane Knitters (7 p.m., Waterworks Barnes & Noble). *As if it weren't enough that our mayor already changed his name to Luke Steelerstahl, apparently we now live in Sixburgh, PA.